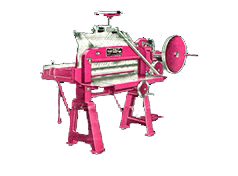 The machines are manufactured with graded casting and steel to ensure accuracy for long time. The machines are strongly built to cut much higher stocks than similar other machines. The height of table is adjustable to avoid and under cutting. Automatic disengagement in the highest position of the knife is there for hand and power drive. The back guage is tunable for slanting and triangular cutting. Narrow strip cutting device has been provided for cutting small labels and visiting cards. Ball bearings and bushes have been provided at vital places. Safety guards are provided at vital places. Fine finish, excellent painting and essential parts have been plated.